A clear problem of being a one-man-band game developer is that I don’t get access to rich game testing resources. As much as I play the game to death whilst developing it I just don’t get the right kind of feedback to help push the game over the line. Indeed one of the issues is that I get just too close to the game and probably accept its problems and limitations. 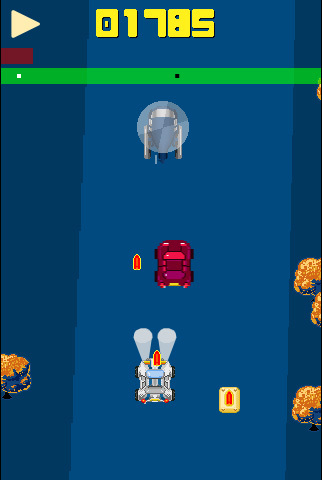 With Spy Chase I resisted adding guns and missiles to the player’s car since I’d always wanted it to be a game about dodging obstacles. But the more I played it the more I realised that I needed to offer some effective resistance to the chopper. The chopper is a big feature in the game and I didn’t want to lose it. But it was proving a real pain and disrupting the natural flow of the action. So I implemented the auto-firing missiles and without giving it too much thought called it “done”. The trouble was I’d instantly undone a ton of hard work. The game became so simple that you could just leave the controls alone and still capture the spies. My last post generated its fair share of inbox activity with numerous suggestions for how I might improve the game. Now I’m not your average developer when it comes to this sort of thing. Many developers that I know would quite arrogantly dismiss these suggestions but I actually read them through and valued the input. If you take the time to type it I’ll certainly take it on board. Several suggestions were not relevant but some were excellent. So I took the excellent ones and played with them. One of the first things to change was the auto-firing weapons. I love auto-firing weapons in mobile games and had got it in to my head that it was the only way to implement weapons. But of course it isn’t. Weapons should be a bonus. As such I made them collectable and further set them apart by changing the firing rate on bullets to be much faster than missiles. Missiles naturally deliver a bigger punch. The biggest change I made though was to the effect that the obstacles had on the player. Previously I’d penalised the player for hitting an oil slick or road cone by decreasing their speed. But this was wrong. It just felt bad that the player had to protect his speed. The largest part of the fun in the game is the high speeds that can be achieved. I wanted to maintain that. So instead I hit the player in the other area that he cares about – car damage. This was actually a huge improvement since it meant that the player could no longer just leave the controls alone and progress. For every collision with an obstacle I hurt the player’s car. This really counts since the further in to the game you are the more likely it is that you will face such obstacles. Finally to help give the player a fighting chance I reduced the maximum speed of the road from 32 to 28. Believe it or not the extra 4 pixels of movement in the road makes a huge amount of difference and can be the difference between deliberately aiming for something or being able to steer out of the way. What I liked about this process was that a) people felt like they could offer suggestions and b) I was able to consider and act upon them with ease since I’d structured my code to be flexible enough. In short this is an exercise in creating a rich array of properties and variables such that at the end of the day I am simply playing with numbers. A valuable couple of days. Spy Chase, my Spy Hunter inspired arcade game, is motoring along and very nearly complete. I finally got around to adding guns and missiles to the game which for me was a vital final piece of the game’s design. I think I balanced the action pretty well so that the player, with a little skill, can be the dominant force in the game. I like to design my games based on a countering method to the obstacles and challenges. From the outset the player faces the challenge of simply steering to remain on the road. 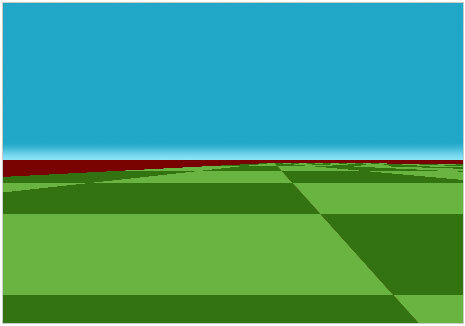 At the head of the screen the player sees a radar. Before long it becomes apparent that the white blip is the player and the black blip is the target spy car. Collecting flags increases the car’s speed such that steering becomes more of an issue. To avoid that becoming a breeze for the player I penalise him for hitting the road verges by a) slowing the car down and b) adding damage (reflected with a red damage bar). This in itself is enough of a challenge to carry the game along a bit but I wanted a lot more early on. So I added other cars to the road. Initially I intended to have the cars run the player off the road but ultimately I settled on having them as a distraction. The player can bump them from the road and earn a points bonus after each stage. It’s still a challenge just to bump them (or shoot them) from the road. Finally I added a chopper which at set periods drops oil bombs on the road. If the player collides with the oil his speed is reduced, the car spins and loses the missiles powerup if the player has collected it. All in all there’s some high-speed fun to be had en route to actually capturing the spy. Once the game is complete I’ll add some more detail to these design notes. The game is designed with mobile devices in mind and has been tested on iPod Touch, iPhone, iPad and HTC Desire. There’s a ton left to do but I’m quite excited about what I have so far. I really want to work on getting the pace of the action right. It’s vital to me that the game feels fast and like a proper James Bond chase along narrow roads. As I’m sure you will see I have a bit to do just yet to achieve this. But it’s going in the right direction. You control this game with the mouse or if you’re on a touch screen device by touching and sliding your finger to move the car. Development on my “Spy Hunter” game is progressing at a rapid rate. I actually call the game Spy Chase and the player adopts the role of law enforcement on the hunt for foreign spies. It’s a high speed chase through several different environments and even includes a night section where the car’s headlights come on ! I’m pretty thrilled by it. It’s important for me to keep up the pace in the game since the real thrill is in closing in on the enemy. As the radar blips move closer together the enemy slowly comes in to view. When the blips collide you have captured the spy ! The more spies you capture the greater your score. That’s pretty much the size of it. What I’m really interested in is the mechanics of the chase. Since it’s vital for me to maintain a sense of speed with the chase I’ve been careful not to litter the road with too many obstacles. Here’s how it currently works. Player collects flags to increase the speed of the car. The more flags the faster the road speed. Player can also ride over a speed strip and achieve a short speed boost. The oil slick spins the car without any control allowed from the player and resets the road speed to the default. The balloon merely bumps the car and slows it temporarily. Of course hitting the roadside verge also temporarily slows the car down. This game is currently aimed purely at mobile devices so the touch screen is the only input. I’ve positioned the car about 1/3 up from the base of the screen so that the player can slide his finger left and right beneath the car without obscuring it. I think the effect is pretty tidy. I’m currently developing a simple driving game that takes its lead from Spy Hunter. The format is simple. You steer a car through a cascading landscape with a varying sized road as your boundary. If you strike the verge your car slows dramatically. If you collect the flags or hit a booster your car speeds up permanently or temporarily depending on which item you struck. To counter the boosts you lose all your speed or spin to a stop if you hit balloons or an oil slick ! Initially I designed it to be a kind of James Bond road race much like Spy Hunter but I since decided against it. Just now it’s a lot like a rally game but I rather like the idea of out-running the police amongst other things. As a kid I played The Great American Cross Country Road Race to death on my Atari 800XL. I’ll bet it’s still an awesome game to play and is certainly helping me to create a fun game just now. When there’s a bit more to see I’ll post up a link and some screens. Something that I should have paid more attention to with the development of HyperGunner was the collision between the player’s starship and the alien’s bombs. During the more intense battles it’s not uncommon to see the player trapped within a mess of bombs with very little room to move. The problem was that the collision detection worked on the bounding boxes of both sprites. Unless the sprites contain pixels drawn to the very edges the illusion (and resulting loss of life) will be less than satisfying for the player. Here you can see (on the left) how I was previously performing the collision detection. Where things happen quickly and on a larger scale it’s rather more forgiving to have this style of detection. For example – the player’s laser colliding with an alien. Generally speaking players are far more forgiving when the resulting effect is in their favour ! But with a slow moving alien bomb drifting down the screen it can be highly irritating to “die” when you’re fairly sure you’ve missed it. So I took a leaf out of my beloved manic shooters and shrank the collision box. In those games it’s fairly common to have just a single pixel in the centre of the player’s ship to collide with. But my game just isn’t that chaotic ! The net effect here is of course that you can generally be pixel perfect and watch the alien bomb pass through the outer 4 pixels of the player’s ship. But that is far more acceptable than what we had previously. I’m in the final stages of tidying up my new frantic shooter HyperGunner. I’ve loved putting this game together and thoroughly enjoyed playing it. It’s a huge step closer to creating something in the mould of my favourite manic shooters – Ikaruga, Don Pachi, Esp RaDe et al. I still have concerns with the collision box but essentially the game is playable. I’m now working on streamlining the game for mobile devices. Specifically iOS and Android. So I thought I’d share the link. Some more sprites to create and a few more backdrops but essentially the core game is in place.